May the joys and blessings of holiday bring another harvest year to you and your family. Winter always comes earlier as expected. But no pity about that – all you need is great winter board for getting fun snow time. 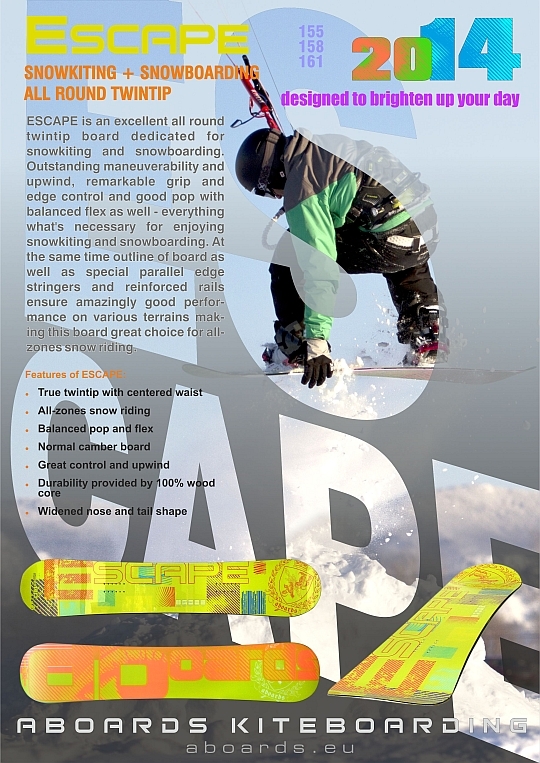 ESCAPE is an excellent all round twintip board for all-zones snowkiting and snowboarding on various terrains. High control of board even when riding very fast allows stabilize board easily on various conditions be it snowkiting on upwind or snowboarding ride on rough or uneven slope. Add outstanding maneuverability and upwind, remarkable grip and edge control and good pop with balanced flex and you will get ESCAPE – ripping winter board for snowkiting and snowboarding! Ask for ESCAPE 2014 to your local dealers or turn to aboards@aboards.eu. There is always snow somewhere and the best way to enjoy it is with brilliant snowkiteboard REVERSE! 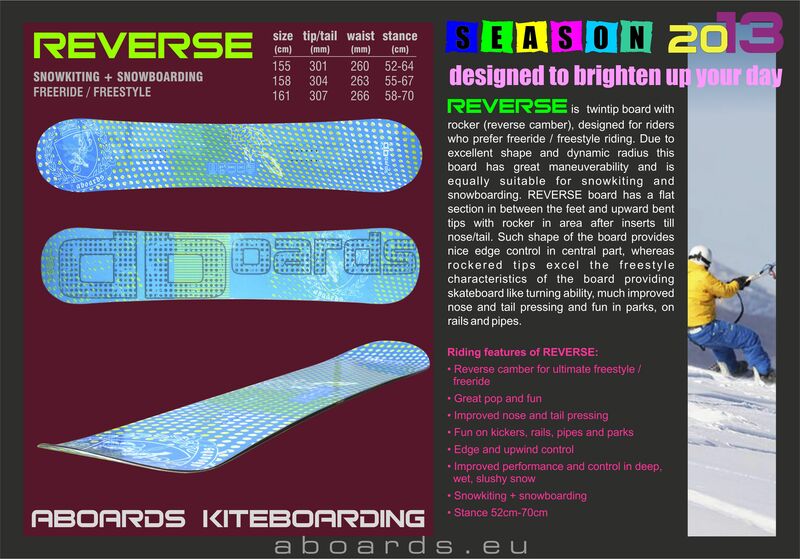 This true twintip winter board with reverse camber will be excellent choice for snowkiting and snowboarding. Snowkiters will appreciate greatly such board features as colossal grip and edge control; massive pop and balanced flex; excellent maneuverability and upwind. 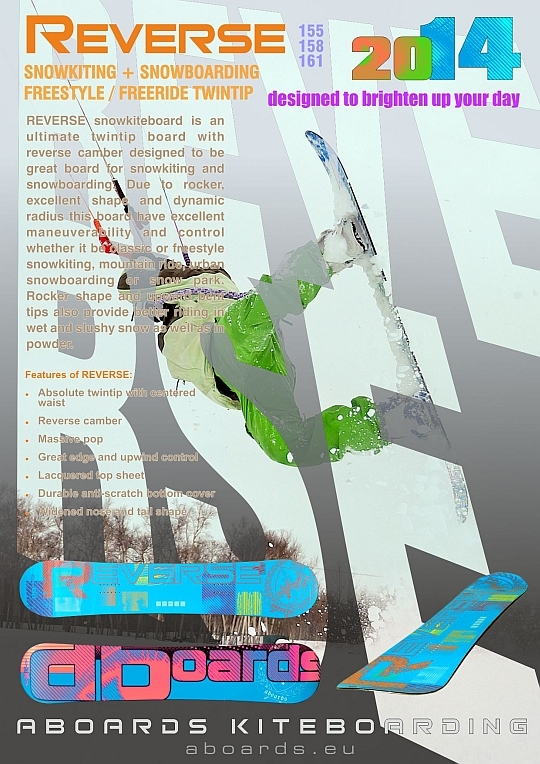 While boards outline and radius make REVERSE great also for snowboarding; twintip shape as well rockered tips giving preferences as on slopes as snow parks. If looking for fun and qualitative time on snow definitely get acquainted with amazing snowkiting + snowboarding winter board REVERSE 2014! Ask for REVERSE 2014 to your local dealers or turn to aboards@aboards.eu. Featuring trustful companion – ABoards REVERSE snowkiteboard. Get ready for snow season! Winter is coming and snow will be here soon. ABoards are ready to be your fun assistant in snow season as well! ABoards winter boards will be great source of fun either with or without kite. To delight you even more time proven excellent features of both models REVERSE & ESCAPE have been complemented with bright and cheerful designs for good mood in any weather conditions. Take a look on ABoards snowboards and choose your toy for winter! If you have ever doubted can kiting on snow be as good as on water check out White Shore snowkiting movie. Dedicated kiting fans take the best what is given by the snow and enjoy it fully. Quebec’s winter snowkiting tales by Vincent Bergeron for your attention. Winter Gallery in ABoards website is upadated for more convenient viewing and regular uploads. If you have interesting and worthy photos with ABoards which you would like to share internationally, send them to us and we will put it online.